Hi there! We are Spotless Commercial Cleaning, a Berwyn commercial cleaning company with a laser-focus on our mission. Our local, family business was started with the single goal in mind: to provide quality, specialized cleaning services to businesses and professional settings. We are committed to keeping up with many industries and their standard workplace practices in order to ensure that we do the most that we can to keep your office clean and efficient to your precise tastes. Every one of our cleaning experts has a history of working in the corporate world, and we come equipped with uniforms and ID badges to suit your security needs. We want to see our neighborhood and area succeed. So work with us to propel your workplace to the next level of professionalism with a professional cleaning schedule! Engineering offices are one of the workplaces that we advertise as a specialty on our website, and for good reason. There are several aspects of engineering offices that require specialized attention from janitorial staff. Here are some of the considerations that we take when handling a space like that. 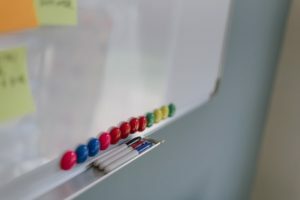 Constant whiteboard usage often leaves long-lasting marker smudges on nearby objects, as well as the whiteboards themselves. Lists and equations that are left too long can be annoying to clean completely. Keep your engineers focused on the important things and let us wash off the stains when the time comes. On the other hand, those important whiteboard notes need to be left alone when you don’t want them cleaned. Maintaining and cleaning around sensitive areas without disturbing work is a sensibility that we bring to the table as an intelligent, professional cleaning company. Wherever high-stakes, technical work is being done, small tasks like picking up trash and sweeping up crumbs are more likely to be forgotten. For good reason! Don’t let your employees get distracted with mundane tasks when they should be putting their heads to better use. We’ll be careful to restore all working areas to spotless perfection and keep efficiency at 100%. To see more of our special considerations for various environments, visit our services page! If your workplace requires special attention and personalized care, there is no better janitorial service to call. Contact us today and we’ll work with you to craft a unique plan to keep your office clean on a daily, weekly or bi-weekly basis.